How can we help you? Find out here. To help great firms in Control & Automation achieve commercial success through building world-class sales, engineering and management teams. 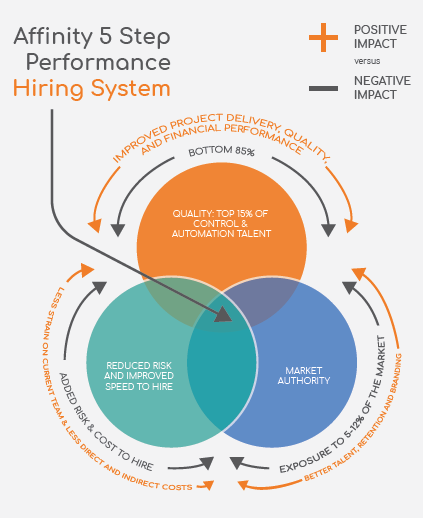 Your recruitment process lacks continuity: There seems to be a revolving door of suppliers, none of whom seem to understand our needs. Whether you are a direct hiring manager, or you support your hiring managers as either a talent acquisition leader or HR professional; you will no doubt be familiar with the above. Imagine you could solve those challenges. What would that mean to you personally? What would that mean to your business? What if the cost of hiring became irrelevant because the value your new hire brought gave incredible return on investment? What if your star players not only exceeded their objectives but attracted other like-minded star players to your company. This can happen. You can realise this kind of success and we can show you how! 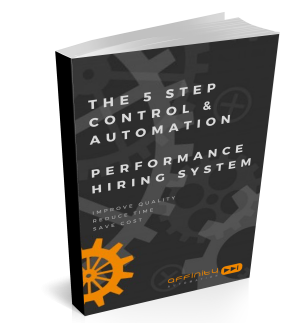 We’re the people that created the “5 step Performance Hiring System” which consistently delivers outstanding, predictable hiring outcomes. What’s more we know the Control & Automation industry intimately. Most importantly, we know how these elements fit together to form a cohesive whole far greater than any part in isolation. So whether you need to build an entire team from scratch, fix one that isn’t working, or you already have this all figured out and simply need a new star for your team, we can make it happen. Copyright 2016 by Affinity Automation.